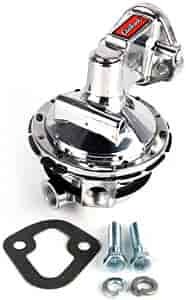 Designed to match Performer Series carburetors, Edelbrock's High-Performance Street Fuel Pumps have 6-valves and a flow capacity of 110 gph. The unique valve design improves flow quantity and quality, and will support engines up to 600hp. High-volume, 3/8'' NPT inlet and outlet surpasses the capacity of conventional models. Produces 6 psi. For gasoline or mixed fuels only. No Regulator required. Clockable lower housing can be rotated in 60° increments for best inlet/outlet alignment. Does Edelbrock 1722 fit your vehicle?